Jake is a man with a reputation. He's a member of the ton, but not someone who cares about propriety, Jake and his friends are rakish rebels who love a good wager. When Jake meets Harriet he's instantly intrigued. He takes quite a risk at their first encounter and knows he has to find out more about this lady who makes his heart beat faster. Harriet isn't like the other women of her class and Jake is determined to make her notice him. He does this in his own cheeky way. Will Harriet eventually start to like him and can she forgive him when she discovers what he's kept from her? Harriet has grown up in an unusual household. Nobody really payed attention to her and having a season is exactly what her mother didn't want for her daughter, but Harriet likes the beautiful dresses and having company for a change isn't so bad either. However, if she's happy with her new acquaintance Lord Becconsall is yet to be determined. Are they equally matched and will they eventually gain each other's trust? The Major Meets His Match is a wonderful romantic story with a lovely hint of suspense. I immediately loved Jake, he's smart and audacious and I loved that even though he comes across as an arrogant man he's actually quite sweet. Harriet is a clever woman, but she doesn't know much about society. She quickly adapts though and I loved seeing her grow. She changes into a capable and brave woman with plenty of sass. I loved the amazing chemistry between Jake and Harriet and their dialogue is absolutely fantastic. I couldn't turn the pages of The Major Meets His Match quickly enough and read this terrific story in one sitting. Annie Burrows has a great captivating writing style. She makes the time she writes about come to life in a magnificent way. I liked that her main characters have flaws and plenty of quirks, that makes them stand out and it kept making me smile. They're both endearing and easy to fall in love with. 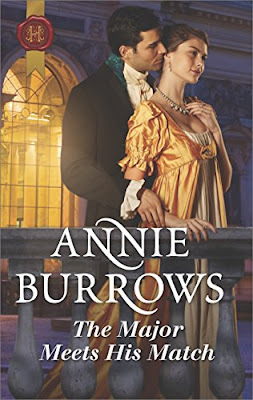 I liked that Annie Burrows constantly managed to surprise me with unexpected twists and turns, intricate plots and intriguing relationships. The Major Meets His Match is charming and entertaining and incredibly well written. I really enjoyed this fabulous book filled with beautiful people, mystery and true love and highly recommend it. When Clare's father passes away Clare becomes homeless, so her brother arranges a position for her. On her way there she meets her old childhood friend Robert, the Marquess of Rawcliffe. Robert intended to Marry Clare when he was younger, but his proposal was dismissed. He might get another chance though, because of a possible scandal. He has to save Clare's reputation and presents her as his fiancée. Clare isn't a meek obedient woman, will he be able to convince her that getting married to him is the right thing to do? Clare used to care for a demanding father and even though she has several brothers, none of them cares enough to take her in. She thinks Robert just messes with her when he proposes and has no idea he's serious about marrying her. When secrets of the past come to the surface, they finally start to understand each other better. However, Robert has an ulterior motive to make Clare his bride as soon as possible. He has a matter to investigate and Clare plays a key role in it. Will he be able to convince her of his love even though he can't be completely honest with her? The Marquess Tames His Bride is a delightful story about true love, passion and mystery. I was immediately intrigued by the bold and confident Lord Rawcliffe. Robert hides his kind and loving nature well, but with Clare he becomes a lot softer. I loved that transformation. He's a good and loyal friend and he's incredibly clever. Clare knows how to stand up for herself, she never lets him walk all over her and I loved her fierce and fiery nature. They're evenly matched and sparks fly every time they are together. Their quarrels are a vital part of their sizzling connection and I enjoyed every single page of their story. 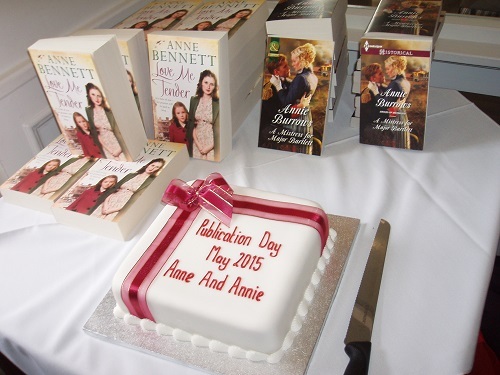 Annie Burrows has a terrific heartwarming writing style. She clearly understands emotions and uses that to her advantage. I loved how she gives each scene plenty of fabulous layers and enjoyed every single one of them. Her descriptive and gripping writing fascinated me from beginning to end and I didn't even once look up while reading The Marquess Tames His Bride before reaching the amazing end. 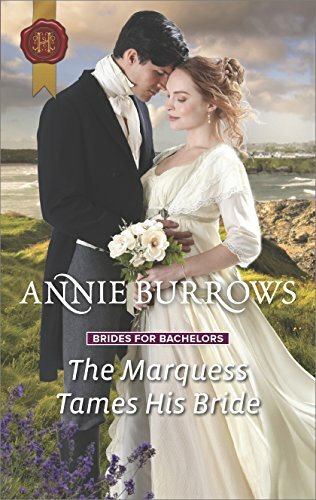 I highly recommend the Brides for Bachelors series, it has every ingredient I like when reading historical fiction, beautiful interesting main characters, intrigues and secrets and plenty of chemistry. The Marquess Tames His Bride is a superb dazzling book and I can't wait to find out what comes next. If you love historical romance you don't want to miss the Brides for Bachelors Series. 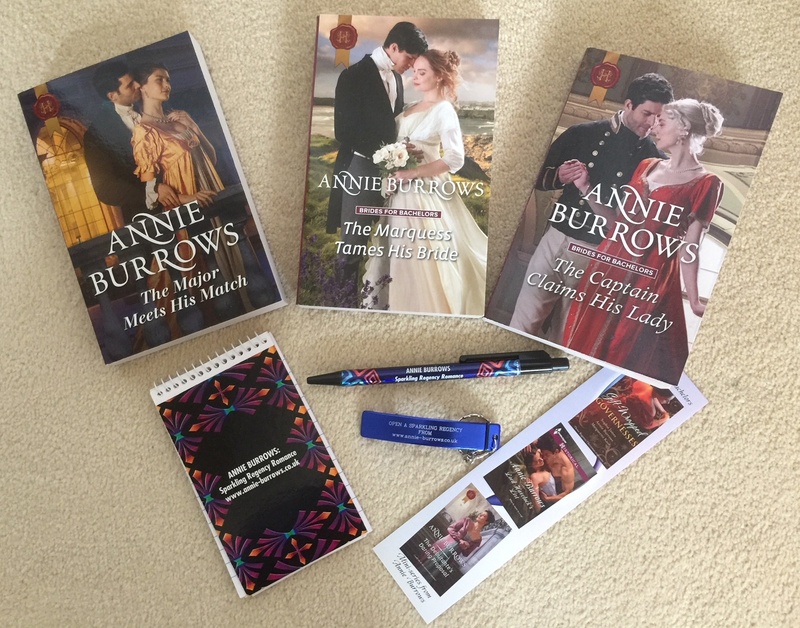 The books can be read as standalones when you read them for the romance alone, but if you want to have every detail of the mystery Annie Burrows is writing about you should start with the first book and read the stories in their correct order. I have been making up stories in my head for as long as I can remember. It was a long walk home from school, and there were no ipods in those days to keep you amused! When I wasn't daydreaming, I had my nose stuck in a book. My parents used to take me to the library every Saturday, until I was old enough to get there on my own, and my house was always full of books. During school holidays, the whole family loved to visit stately homes and castles. As soon as we got home, my older sister and I would either dress up as lords and ladies, and romp around the garden, or, if it was raining, retreat to our bedroom where we would draw intricately detailed plans of our very own imaginary stately home, complete with secret tunnels, dungeons, and usually, a maze in the extensive grounds. When I was old enough to go to university, I studied English literature, with Philosophy. I was not sure what I wanted to do after that, but meeting a handsome student of maths, who was the owner of a very powerful motorbike helped me make up my mind. Reader, I married him. For many years I felt it was important to stay at home to raise our two children, but one day, when the youngest had gone to senior school, I began to wonder if all those stories I made up to occupy my mind whilst attending to mundane chores, would interest anyone else. I started to write some of them down, and eventually decided that one of them was "deep" enough to merit attention from publishers! It took me almost two years to complete, mainly because I kept tearing it up and starting all over again. And having to keep going out to work to help pay for school fees, then university tuition, slowed progress down as well. Needless to say, this masterpiece was rejected by every single publisher I sent it to, but by this time, writing had become an addiction. Four more stories got rejected before Mills & Boon bought "His Cinderella Bride", my first regency romance. I’ve always been an avid reader. And if I didn’t have my nose buried in a book, I would be daydreaming up stories of my own. I took English Literature at University, because it meant reading a lot, and then writing about what I’d read, though I hadn’t a clue about what to do with that qualification when I got it. However, once I did decide to write stories for publication, what I’d learned did come in handy. 2) You write about strong women, which key characteristics should a good regency romance heroine have? 3) What made you fall in love with regency romance? Reading lots of them! I particularly enjoy the regency romances of Georgette Heyer, though once I discovered the historical romances published by Mills & Boon, I felt as if I’d really found my niche. 4) How do you handle the research for your stories? I read a lot of biographies of people who lived in that era. At the moment, I’m reading about Captain Scovell, who was the man responsible for breaking Napoleon’s codes during the Peninsular Campaign. Reading about people’s lives tells me all sorts of things about the kinds of possibilities I can have for my own stories, as well as giving me lots of background detail about the era. Occasionally I get a more fact-based book, such as an itinerary of stage coaches, or a political book about Paris during the Napoleonic wars. However, whenever I put too much of that period detail in my stories, my editor always complains that it is slowing down the pace, and urges me to concentrate on the budding romance. So it mostly has to stay in the background. However, I do think it is very important to gain as much knowledge as possible about the period, to make my stories “ring true”. I wouldn’t want to inadvertently have my characters do or say something that they couldn’t have possibly said or done in the early 1800’s, because my readers are very knowledgeable about the period, and it would spoil their reading experience. And as I live in the UK, there are heaps of stately homes I can visit, where I can walk round rooms imagining what it would have been like to have lived there at the time. Just seeing a dining room set out with all the silver and porcelain conjures up such an evocative atmosphere in which I can set my stories. 5) You’ve worn a dress from the period you’re writing about yourself, how was that and if you could wear it traveling back in time where would you go to wear it? That was such fun! And also very enlightening. I always assumed that regency women must have been frozen, going about wearing such flimsy cotton or muslin gowns, but what I learned was that actually all the layers trapped a lot of heat, even though each layer was such light material. 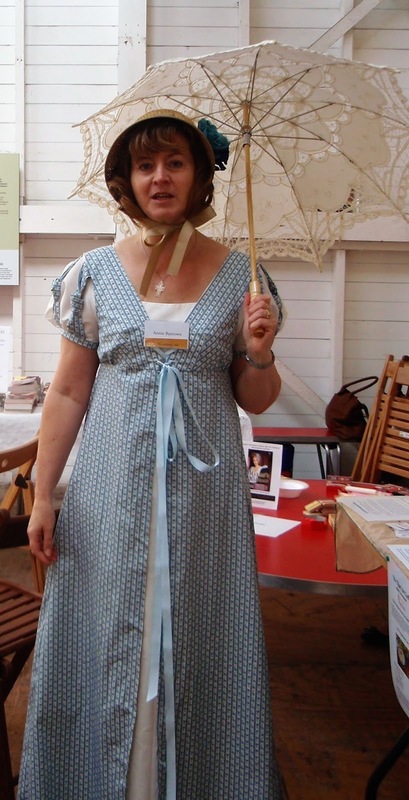 It was summer when I spent a day in a full-length regency outfit, and I was too hot to wear the full length petticoat supplied. The dress and overdress alone were enough to keep me comfortable. If it had been winter, a heavier material for the underdress and overdress, with a flannel petticoat and thick stockings, would have done. Plus a spencer, of course. Also, wearing a bonnet really does keep a body warm, as well as protecting the complexion! Where would I go? Well, the gown I wore was a day dress. I would not have been able to attend a ball in it, but I would have loved to have strolled through a market of the time, or visited the shops, (with a footman in tow to carry all my purchases home) and seen all those bolts of cloth with such lovely-sounding names – poplin, sprigged muslin, slub, twill, damask…and hopefully run my fingers over the fabric to feel the difference in weight. I am old enough to remember going into shops that sold fabric by the yard, and recall the rich, sweet smell of brand-new cloth. I would love to have been able to do that in Regency London. And don’t get me started on ribbons! 6) You often meet with author friends, what’s the most fun about those meetings? However, as well as having fun celebrating our successes, it is very valuable to be able to talk to other writers, who have experience of various methods of publication, as mostly, otherwise, I work alone. It’s great to be able to bring a dilemma to a panel of such experienced ladies, and be able to talk through where to go next. 7) True love is important in all of your stories, what does true love mean to you? I must confess to being a romantic myself, or I couldn’t write stories where finding a soul mate equates to a happy ending. I believe that life is so much richer if you have someone to share it with. 8) How did your love for books start? My parents both loved books, and there were always lots of books in the house. Bedtime stories were a feature of my childhood. We weren’t very well off, but my parents made sure I always had access to books suitable for my age by taking me to the local library every week, as soon as I was old enough to read. This was a jolly good thing, as I was rather a sickly child, and spent a lot of time off school, especially during the winter. Books filled those hours when I could do nothing more strenuous than sit up in bed, and took me away in my head to far happier, more interesting places! 9) What should a good romantic happy ending look like? The hero should be completing and enriching my heroine’s life. And she should be the answer to his needs, too. My writing plans…as ever, my head is bubbling with ideas I can’t wait to get down onto paper! Currently, I’m writing a story involving a bookish, bespectacled lady code-breaker (hence the research into Captain Scovell), who is trying to persuade an impossibly handsome, rakish Marquess that she can help him track down a traitor. It’s all a bit nebulous at the moment, but I’m hoping they will engage in a lot of spirited banter and indulge in some clandestine kisses on the way to unmasking the villain. One very lucky reader of With Love for Books will receive signed paperback copies of The Marquess Tames His Bride, The Major Meets His Match and The Captain Claims His Lady by Annie Burrows. I love happy endings! Your books sound awesome. Both books sound like sweet, funny, heartwarming historical romances. Would love to win these books for my Mum who reads a lot. good luck in the draw Sue! I've read some of your M&B books and love your imagination - this is a fab opportunity, would love to win!! Robert and Clare sure sound like a fun couple to follow their romance and twists and turns! Your books look fabulous. I can't wait to read them! Hi Linda - I love historical romance too! I love historical novels and your novels sound wonderful. A genre I love to read. I also love your outfit. thanks Mary. I loved that outfit too. Wish I had a chance to wear it more often. thanks Ellen - good luck with the draw! Hi Annie! Your stories sound wonderful and I LOVE those book covers!!! Thank you for a chance to win them! I really enjoy historical novels and if there's a bit of romance thrown in all the better. This sounds like a great series for me. Your book cover looks amazing! thanks Wanda - the art department have given me some gorgeous covers lately! how lovely to hear that Alan, thanks! Beautiful book cover! I would love to win this book! What lovely books! Great interview. Thanks for sharing. Yes, Angela - they don't have the funds to buy so many new books any more. I recently went to a "protest" when the council threatened to close our local library. No placard-carrying. Instead, all us protesters went on a chosen day and checked out as many books as we could. The library was saved! I love historical romances and I find this cover so gorgeous. These books seem amazing! Congrats to Annie Burrows for her great job! First of all I love the covers (my first "hook" if you like) but they sound a great blend of mystery and passion. Love historical romances as they take you back to a time when gentlemen used to be gentlemen and hold doors open etc for ladies (unlike today as you are just as likely to have the door slammed in your face). I'd probably be the "help" though, so no driving around in carriages lol. "I must confess to being a romantic myself, or I couldn’t write stories where finding a soul mate equates to a happy ending. I believe that life is so much richer if you have someone to share it with." I used to have a dress just like yours Annie. Mum made it for me back in the '70s when maxies were all the rage!